Thorns of Life loaded in their own equipment as about a hundred kids looked on in a scene that must have been reminiscent of Blake Schwarzenbach’s humble beginnings playing houses and small clubs in San Francisco, L.A and the East Bay. Schwarzenbach, considered one of the biggest influences on punk and emo music, is back playing and writing music with his new band Thorns of Life after nearly a six-year hiatus. Last night they played Thrillhouse Records. Thrillhouse, next to the 76 on the corner of 30th and Mission is the prototypical punk rock record store. The store is a non-profit collective and part of a house where six of the members live. It houses a DIY record label and is also a show space (although the Fire Marshall shut down the basement last summer). The venue embodies the ethos of Schwarzenbach as an artist- entirely focused on the music and having a good time with no attention paid to making money or drawing huge crowds. If Jawbreaker is the sound of the Mission, then this is how the Mission parties. The atmosphere was distinctly different from the show Thorns of Life played at the Hemlock on Monday. 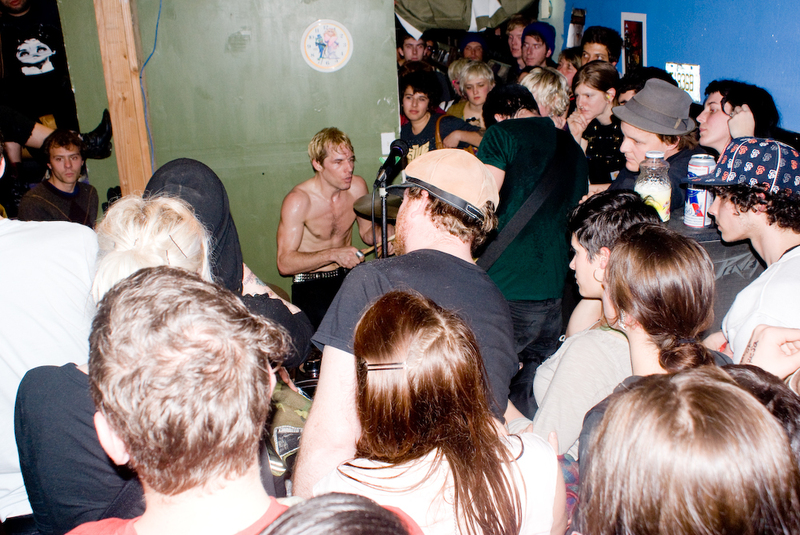 The only famous musician I saw at Thrillhouse was the Mission’s own Adam Pfahler who was the drummer in Jawbreaker and now owns Lost Weekend Video (as opposed to Fat Mike from NOFX and Billie Joe Armstrong of Green Day at the Hemlock). There was no guest list, no line to get in and no obnoxious bar owner telling people to leave or that there wasn’t any room. At Thrillhouse there wasn’t any room, either, but everyone who made it was invited in with open arms. At the Hemlock, crowd members rudely shouted out names of Jawbreaker songs and at Thrillhouse the crowd bantered with members of the band and songs were dedicated to Harvey Milk and Mayor Moscone, “Don’t forget about Moscone, he got blasted too. Every time you go to the Moscone Center think about that,” Schwarzenbach quipped. The show itself was great. 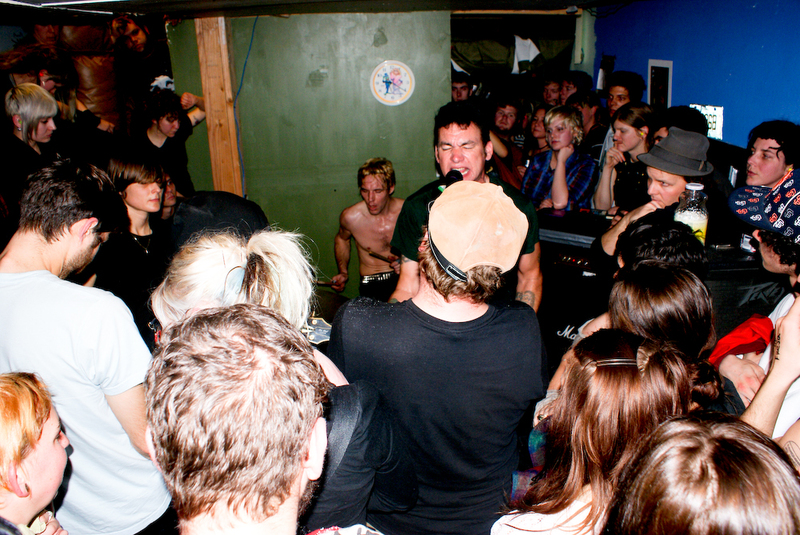 If a comparison has to be made to Schwarzenbach’s other bands (and plenty are being made already), the music was the same combination of literature as lyrics and three chord punk that Jawbreaker fans love, with certain songs dropping the tempo and building in complexity in ways that are similar to Schwarzenbach’s second band Jets to Brazil. However, because of the three person guitar-bass-drums set up of Thorns, the sound is decidedly more punk and upbeat than Jets to Brazil. Blake’s telltale growl shines through it all, a familiar voice we never thought we’d hear live again. Thorns of Life play 924 Gilman Street in Berkeley on Saturday. Thorns of Life house show in Brooklyn (Video) at Bohemian.com (Thanks, Thaddius!). The Sound of the Mission on Mission Mission. Thrillhouse Toilet Graffiti on Mission Mission. Great review, thanks! It’s cool of Schwarzenbach to play at Thrillhouse. Sounds like a good time. Hey, remember that guy behind the drums? Aaron Cometbus? You know, of COMETBUS fame? And Crimpshrine? And Pinhead Gunpowder? and Shotwell? and ASTRID OTO? and…. Wow! Great review. Plan on heading to Oakland to see him on Saturday, thanks. Arrrrrgh, I wish I’d known… I’ll be there at Gilman like all the other old folks. woah!!! just realized that’s me on the very left in the first photo! what a RAD night!